The seven Canary Islands are located in the Atlantic Ocean 80 miles west of Morocco. Known as the ‘islands of eternal spring’, they enjoy a great climate year-round: summers are dry and warm with temperatures in the high 20°Cs and up to 10 hours of sunshine a day. Heatwaves can take temperatures well above 30°C. Even if you visit the Canaries in winter, the climate is still comparable to summer in Western Europe. Temperatures are mild at 18-21°C, with 6 hours of sunshine a day. But which is the hottest Canary Island? For the best chance of hot weather in winter, you should think more about where to stay on one island rather than which island to choose. The northwest coast of each island tends to be the coolest and wettest because it’s more exposed to Atlantic trade winds. Inland and on higher ground, the climate can also be unpredictable and much cooler. The southeast coasts tend to be warmer and sunnier. This is because the islands are mostly mountainous, so the trade winds dump cloud and rain on the north and west coasts before they reach the south-east. However, the islands do have some distinct variations between them in weather due to their location and topography, so you should take these factors into account when looking for the hottest Canary Island for your holiday. Tenerife is the largest of the Canary Islands. It is home to Mount Teide, the highest point in Spain. Even in winter, temperatures rarely fall below 18°C and in summer can climb to 30°C. Like the other islands, there is a clear difference between the weather in the south and the north. 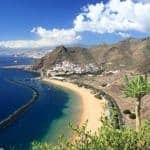 The southwest coast and, in particular, the resorts of Playa Las Americas, Costa Adeje and Los Cristianos are best for sun seekers as they enjoy up to 10 hours of sunshine a day. 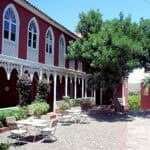 However, many visitors prefer the unspoilt and more authentic north of the island, away from the busy tourist resorts. Unlike on Tenerife, there is little seasonal variation in the weather on Gran Canaria. Temperatures rarely drop below 24°C throughout the year. Resorts in the South such as Playa del Inglés, Arguineguin and Puerto de Mogán can expect 10 hours of sunshine a day and temperatures of 28°C. Even in winter southern resorts reach 22°C with 6 hours of sunshine a day. However, like the other islands, there is more regional temperature variation across the island because of the central mountain ranges. Temperatures in Fuerteventura rarely fall below the low 20°Cs, even in winter. However, summer temperatures tend not to be as hot as other islands with averages of 24°C. This is due to breezy weather. Due to the flatter landscape, there is less regional climatic variation than on other islands. Fuerteventura is also sheltered by Lanzarote, which lies less than 10 miles to the north. This means northern resorts such as Corralejo are just as popular as southern resorts for sun seekers. Lanzarote tends to be the hottest and most arid of the Canaries, as it is closest to the Sahara desert and because it is one of the lowest lying islands. The Sahara can bring high temperatures and fine sand to Lanzarote, causing heatwaves at times. Like Fuerteventura, Lanzarote is relatively flat which means there is little regional variation in weather conditions. However the South and south western regions such as Playa Blanca, Puerto del Carmen, Playa Honda and La Hoya are sunnier and drier because of two small mountain ranges. Average temperatures in the south range between 21-25°C, with highs of 28°C in summer. The small islands of El Hierro, La Palma and La Gomera lie furthest from Morocco. They tend to be cooler and less busy. Temperatures in mountainous regions can fall to around 14°C and may be misty, with greater rainfall and far less sunshine. However temperatures in winter are still around 18°C, and may rise up to the high-20°Cs in summer along the southern coast with 7 hours of sunshine and low rainfall. These islands are perfect for hiking holidays, water sports and for those who prefer peace and quiet. Even though these islands are generally not the hottest in the Canaries, they are stunning to visit. 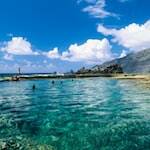 See more about the best time to visit the Canary Islands, and where to go.